Growing up in the Olney section of North Philadelphia in the 1940's & early 1950's. Cold War Military Service in the US & Germany during the mid 1950's. Employment within a public utility company from the 1960's into the 1980's. Pete Byrne is a retired corporate and advertising copywriter living in New Jersey. He's a parent, grandparent, music enthusiast, a sometime painter and a former snowboarder, not necessarily in that order. 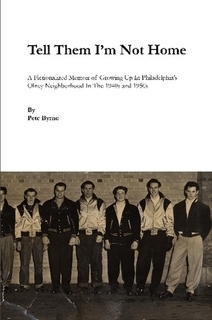 His first memoir, 'Tell Them I'm Not Home' (2011) recalls coming of age in the Olney section of North Philadelphia in the 1940's & 50's. "Tell Them I'm Not Home" is a lightly fictionalized memoir of growing up in the Olney section of North Philadelphia in the decade following World War II, a place not unlike Jean Shepherd's Hammond, Indiana of a decade earlier. The close-quarters life in a blue-collar neighborhood of row-house streets provided the author with a cast of characters, many funny, some scary, as well as a near-endless litany of stories. "Tell Them I'm Not Home" is a ticket back to the Olney of the late 1940s and early 1950s, a place as singular, colorful and as lost to today as Hapsburg Vienna or tenement New York. 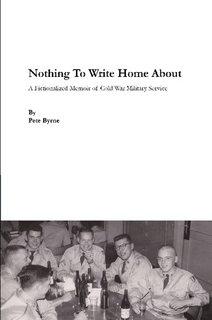 His second memoir, 'Nothing To Write Home About' (2015) follows his journey through the U.S. Army in the 1950's with stops in Colorado, South Carolina, Arkansas & Germany along the way. "Nothing to Write Home About" is a lightly fictionalized memoir of a now distant period of recent American History, "The Cold War." In mid-1950s America, a rite of male passage was a couple of years of non-threatening, peacetime military service. By 1955, the war in Korea was two years past and Vietnam was still just a name. For the author, then aged eighteen, the Army offered an escape from the confines of a blue-collar neighborhood, a first opening on and into a larger world, a semi-grownup world filled with characters from all over the country, some good, some not so good and some just outlandish. Two years in the Army, with duty in South Carolina, Arkansas, Colorado and finally Germany became, unknowingly at the time, one of the genuinely educational and more memorable experiences of a lifetime. His third memoir installment, 'Pleasure Island' (2017) traces his unlikely employment trajectory at a public utility company during the 1960's through the 1980's, withstanding early years of shift-work and eventually ascending to the challenges & tragic comedy of corporate middle-management. 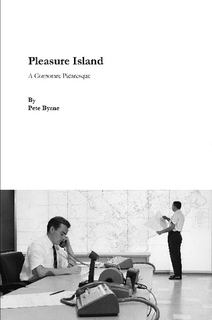 "Pleasure Island" is a novel based on a nearly 35-year working life in the madness, absurdity and surprisingly rewarding bureaucratic world of a late 20th Century American corporation. Our Hero, of sorts, is an utterly inauspicious candidate for management. After 14-years as an hourly worker on rotating shift-work, he makes his first move of many, discovering quickly that he's not the only faker with a glass-walled office. Caught between the unrealistic demands from above and the almost unmovable inertia of many of his legacy employees, he survives and even prospers, despite himself.